Waiting for the Anger to Subside. I’ve been waiting for the anger to subside. For much of my career, I’ve witnessed the waste and distraction to American business caused by patent trolls and the burden they place on our judiciary. Despite my sometimes cynical attorney exterior, this year I had genuine hope that the U.S. Senate would finally make the legislative changes necessary to remedy this situation. After all, in an era when U.S. politicians can agree on very little, both the House and President came out strongly in favor of patent litigation reform. All that was left was Senate approval. Evidently the patent trolls were anticipating legislative reform as well. 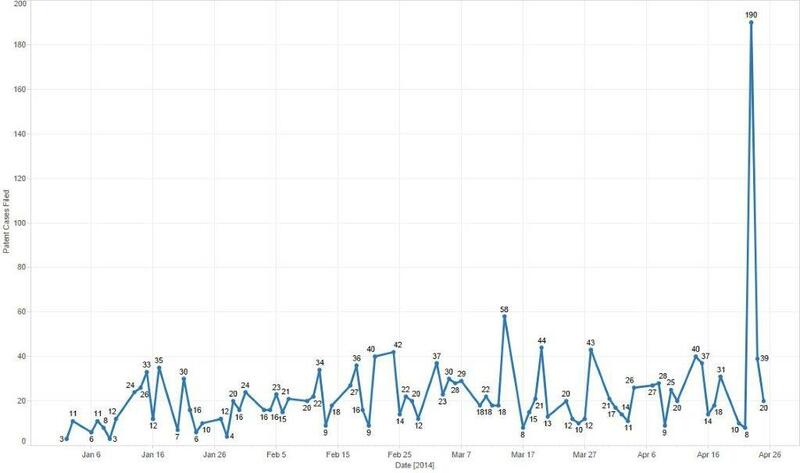 This graph (courtesy of Lex Machina) shows the number of patent cases filed in Federal Court this calendar year. See that spike? Those are patent lawsuits filed immediately before the cutoff date for retroactive application of the fee shifting provision contained in the proposed Senate legislation. But, in the end, the Senate, after extensive hearings and fact finding, chose not to take action. By doing nothing, the Senate decided that it values jobs for trial attorneys over jobs in STEAM (science, technology, engineering, arts and mathematics) and other areas of innovation. Senate lobbying by trial attorneys against any type of legislative patent reform was expected. But, I think many underestimated their influence, especially given the large number of American retail and tech companies that supported the legislation – the signatories to this letter, for example. Also of surprise was the opposition from colleges and universities, many of them public institutions who presumably want to see patent trolls continue to grow as a source for universities to monetize their patentable innovations. Think about that last nugget for a moment. Whether through tuition or taxes, we are all funding colleges and universities to educate our citizenry and create employment opportunities. Yet at the same time, many of these same institutions are selling patents to patent trolls and actively opposing patent reform, and, as a consequence, supporting a system that diverts company resources from funding job creation to litigation defense. Anyone see a conflict here? But all is not gloom – far from it. In April, the Supreme Court, unlike Congress, chose to take action. In its decision in Octane Fitness v. Icon Health, the court expanded the circumstances under which a winning litigant can recover attorneys’ fees, helping to end the asymmetry on which patent trolls thrive. Since then a number of courts have taken this decision to heart and begun awarding fees. For my fellow in-house practitioners, make sure to read Judge Cote’s Opinion and Order in Lumen v. Findthebest.com. I’ve never met Judge Cote, but she has become my new judicial superhero. Last week, I sat through extensive reviews in preparation for two patent troll cases that are scheduled for trial in late summer. In one case, Adobe is alleged as the patent infringer; in the other, we are indemnifying one of our customers. In both, we are well represented, prepared and looking for our day in court. If Congress won’t act, it is up to all of us to defend ourselves against these abuses. Patent litigation defense is expensive, time-consuming, and wasteful of resources. It can be tempting to just shell out a few dollars to make the current case go away. But, for those that can afford it, standing up to the trolls is the right thing to do, and the only path forward.